Vermont utility Green Mountain Power has been taking a leading role in setting up innovative monthly installment plans for customers interested in distributed energy resources, from smart thermostats to Tesla Powerwall batteries. Now it’s seeking to tap another kind of battery -- one that’s already installed in about 50,000 homes in its service territory. 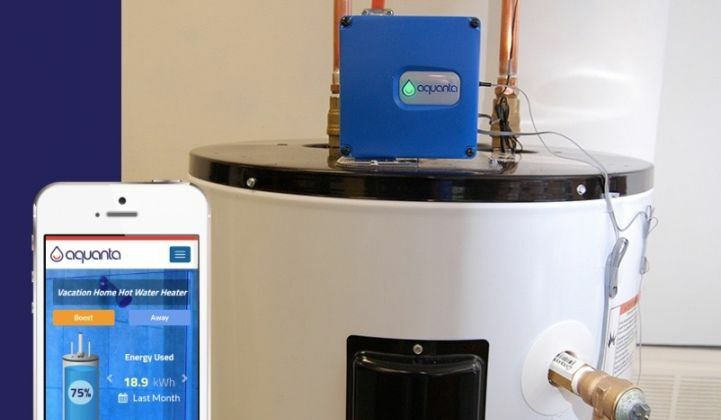 Last week, GMP launched its eSmartwater program, a pilot that’s targeting about 500 customers with an offer that includes electric water heater controls from startup Aquanta, combined with a free Nest thermostat, for a fee of 99 cents per month. So far, about 100 customers have already contacted the utility expressing their interest in participating, said Josh Castonguay, GMP’s director of generation and renewable innovation. But the utility has already been testing Aquanta’s technology for several months, with the goal of using its real-time networks and predictive analytics to turn a customer’s existing water heater into an energy-saving and grid-responsive energy storage device, he said. GMP estimates that about 50,000 electric resistive water heaters are in use by its customers. Each uses about 4 kilowatts of energy when it’s on, making it a significant household load, and a natural target for demand response programs that pay customers for the right to shut off their water heaters in emergencies. In fact, GMP already has several thousand customers enrolled in this kind of program, said Castonguay. But direct load control switches can’t tell you how many water heaters are actually on at the time, or calculate how much longer they can stay off without leaving homeowners with tepid shower water, he said. That’s where Aquanta steps in. Last year, the Washington, D.C.-based startup launched a $150 device that installs on existing water heaters, measures both electricity and temperature, and connects via Wi-Fi to its cloud-based software platform to allow direct control via the homeowner’s smartphone. This platform also grants the utility access to these water heater sensor-control devices in aggregate, not just as an emergency demand response resource, but as part of controlling its larger grid needs. As part of GMP's 99-cents-per-month deal, customers will agree to allow the utility access to the water heater controls within certain parameters, including the right to opt out of any utility call if it’s going to leave them with cold water. All of these will come with some estimate of how long it can be turned off before the water turns too cold, providing a duration figure of sorts at individual and aggregate scale. GMP is using software from Virtual Peaker, a Kentucky-based startup that was one of five to win the utility’s GMP Inspire Space contest last year, to manage these grid integration tasks, he said. “We can basically push a button, schedule water heaters to turn off at this time,” and use the resulting load drop to reduce systemwide capacity charges, or mitigate congestion on distribution circuits. Conversely, “We could turn up the set point a few degrees during a hot day to soak up the solar power being generated locally,” he said. That would make water heaters into an energy storage device of sorts -- as long as they don’t make their water too hot, and thus unsafe for the people using it. This is Aquanta’s first big utility contract, and it represents an important testing ground for the company's commercial offering. CEO Matt Carlson said the technology has shown it can save customers between 10 and 30 percent on their water heating bills, simply by studying each home’s water usage patterns and doing things like not heating water when nobody’s at home. There are millions of remote-controllable water heaters across the country, using load control switches from companies like Emerson or Eaton's Cooper Power Systems. But they're almost all one-way, pager-controlled on-off switches, installed by utilities that pay customers in exchange for the right to turn off their hot water during times of peak energy demand. Specialty equipment providers like Steffes Corp. are building more sophisticated systems capable of two-way communications and more fine-tuned control. But Aquanta is one of the few companies linking water heaters directly to customers through mobile and web apps, Carlson noted. That could help drive adoption among homeowners looking for the latest smart device to add to their roster. There’s certainly a lot of opportunity for grid management of electric water heating. Last year, the Natural Resources Defense Council and the National Rural Electric Cooperative Association found a range of values for grid-responsive electric water heaters that can range from $50 per year in simple applications, to hundreds of dollars per year for more lucrative and demanding grid-balancing tasks.